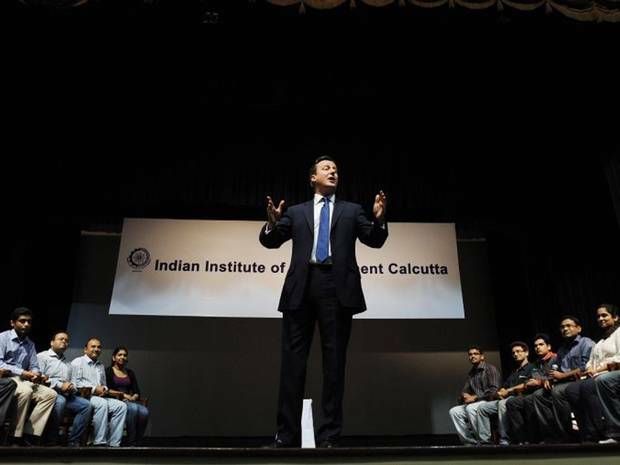 So, the world knows by now that the British Prime Minister decided one random day to interact with the students of IIM Calcutta, a fact that we are all extremely proud of, both at an intrinsic level and the external benefits of sharing it on Facebook. I was among the lucky students chosen to be on the stage with Mr David Cameron. It was more of a figurative position than anything else but I will not deny that it felt nice. The amount of research all of us did to pose pointed, intelligent questions to him was I believe enough, to sustain a one-week conversation. This is something fresh I’ve experienced in IIMC, the levels at which people are prepared for everything is phenomenal. Kudos to our student body for that. The British High Commission must have gone away very impressed in those 45 minutes. At a broader level, isn’t this what an MBA is all about? Interacting with industry titans, global leader, and students from different streams, with different ideas, hopes and aspirations. The opening up of perspectives is the most significant way in which a B-school can impact you and providing forums for such interactions is one of the best ways the school can accomplish this. In this regard, we at IIM Calcutta have been very lucky indeed to have shared the stage with Mr Dinesh Trivedi, Mr Sam Pitroda, Malli Mastaan Babu, Ms Vini Mahajan and of course, Mr. David Cameron in our first 4 months here already. As for the session with the Prime Minister himself, I must confess at the very beginning that I have been a fan of Mr Cameron since a long time, and supported him in the 2010 elections as well, so my opinion might be a little biased. He has to be one of the most charismatic politicians in the Western Hemisphere. His mannerisms on the stage, his response to the tougher, controversial questions and his general persona all reflected the image of a man in control and who knows what he is doing. By extending an open invitation to Indian students for higher studies in the UK, proclaiming his support of a permanent seat for India in the Security Council, I am sure he must have won quite a few brownie points as well. My question to him, about coalition politics was something I have always been curious about in reference to countries other than India. At the outset, thank you to the Prime Minister for taking up the question. On his answer, I recognize the limitations that he faces while commenting on a politically sensitive set-up in an academic institution. But the way he dealt with the question was phenomenal and maybe our Indian politicians could take a leaf out of his book for that. He accepted the fact that it is frustrating to see your proposals blocked in a coalition set-up as with the Royal Charter on Press Regulation but also impressed upon the fact that the parliament has to reflect the mandate of the people. And if they have indirectly chose a hung parliament, we need to respect that. I would conclude by re-emphasizing the importance of such visits and experiences in forming perspectives. Unless you read something new, watch something new, experience something new or interact with someone new, you don’t grow. Thank You IIMC and thank you David Cameron for providing us with this opportunity to grow.